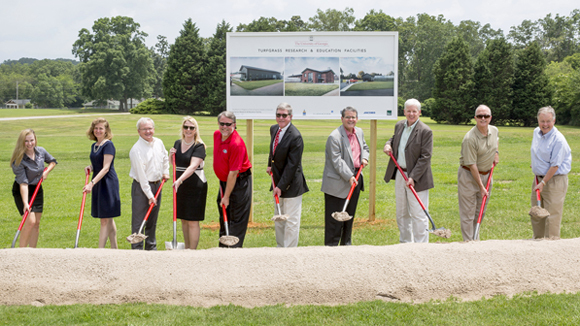 More than 200 people gathered June 24 for a groundbreaking ceremony that brought new turfgrass research and education facilities on the University of Georgia’s campuses in Griffin, Tifton and Athens one step closer to completion. During the 2014 legislative session, Gov. Nathan Deal and the Georgia General Assembly approved $11.5 million for a statewide turfgrass facilities enhancement project. Outdated facilities on UGA’s campuses will be replaced with labs, greenhouses, classrooms and office spaces designed to keep the university at the forefront of turf breeding programs around the nation. The college has been serving the turfgrass industry for more than 60 years, starting in the 1950s with a warm-season turfgrass breeding program. UGA researchers—known as the Turf Team—continue to develop and evaluate new varieties, searching for those that require less fertilizer and are more drought, disease and pest tolerant. In the college, 10 faculty members focus primarily on turf along with an additional eight researchers who have involvement in turf-related projects. Additional ceremony speakers included Tommy Hopkins, regent of the University System of Georgia, and Ken Morrow, president of Sod Atlanta Inc. Ultimately, a turf scientist’s work is about building relationships, said Becky Grubbs, a doctoral student in the college’s crop and soil sciences department. “In turfgrass science, we do not grow food, and we do not grow fiber. We grow human experiences and human connections,” Grubbs explained. “We grow the soccer fields that children play on during the weekends, we grow the football fields that we love to visit every fall, we grow the parks that we spread blankets out on to watch fireworks, we grow the yards that we stand on in our bare feet, and we grow the golf courses that someone’s grandfather plays on every Sunday. For more information on UGA’s turfgrass programs, visit www.GeorgiaTurf.com.